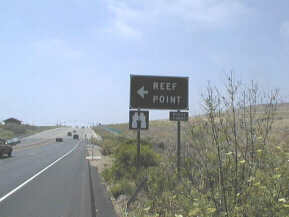 The Crystal Cove state park at Reef Point is not actually in Laguna Beach. The area is located between Corona Del Mar and Laguna Beach on Coast Highway (Highway 1), along coastal bluffs as well as chaparral canyon on the inland side of the highway. From Broadway in Laguna Beach travel north on Coast Highway about 4.3 miles until you get to the traffic light for Reef Point. At the traffic light turn South (towards the beach) and enter the park. 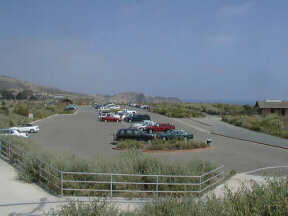 Crystal Cove / Reef Point has several good sized parking lots and would even be able to handle a good sized motor home. The parking / day use of the park $15.00 per car and a yearly pass is just $195.00. There is an entrance station where parking fees are paid. After entering the turn to the left hand parking lot and proceed to the bathroom where the telephone is (see facilities), this is the closest to the beach access steps. To get to the beach walk along the path behind the bathroom. The path takes you to the first set of steps made from railroad ties. They are steep and there are over 100 of them. This takes you down to the lower park of the steps made out of concrete and at the end of the concrete there are another 12 steps out of railroad ties. This is a big hike and is very steep. Please relax and take your time navigating the staircase, with or without Scuba gear. 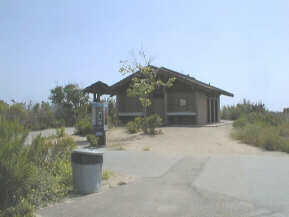 The facilities at the Crystal Cove park at Reef Point feature a telephone, bathrooms, changing rooms, showers and a countertop with sinks and water. The published rules allow propane stoves. This is a nice area to have a picnic. The rules also say to stay on the trails and to stay off the cliff faces. You even need to be careful while doing that, see below! While doing photo's I came across one of the local residents of the park. This Rattlesnake was leisurely sunning itself on the pathway in the park. 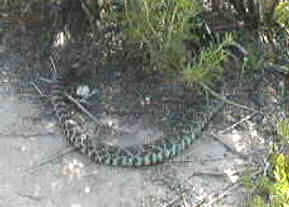 BE CAREFUL this is a wilderness area and this type of creature make their home in wilderness areas. Don't venture off of the trails and don't let children or pets wander unescorted through the park, YOU HAVE BEEN WARNED! Diving at Crystal Cove / Reef Point. This cove has always been referred to as Scotchman's cove by divers. In the park's own literature they still call it Scotchman's Cove, but you don't see it indicated anywhere else at the park. So, if you are looking through an older dive guide (even some newer ones) and they talk about Scotchman's Cove, this is the place. 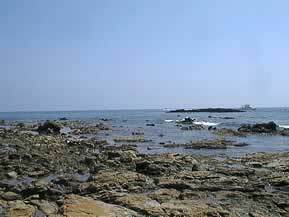 There are rocks, reef and great diving all around this area. If you are on the beach looking at the water the rock sticking out of the water to the right is an excellent choice. Make sure that when you enter the water you do it from the beach area to the east of the rock. If you enter close to the rock you find that the bottom is very uneven, very shallow for a long ways with lots of rocks that just love to bash your shins. If you enter from the east side of the rock and swim out then over you can save yourself some damage to your body and gear. 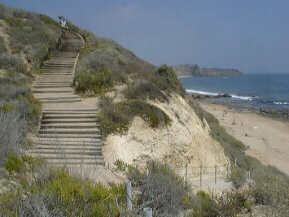 The Crystal Cove State Park area has 3.5 miles of beach and 1100 acres of off shore area designated as an underwater park. 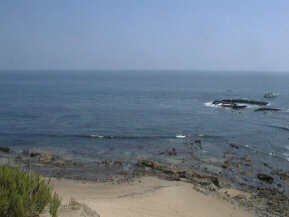 The entire CCSP offshore area lies within the boundaries of the Irvine Coast Marine Life Refuge. All tidepool specimens and marine life, with the exception of certain fish and lobster are protected and may NOT be taken or disturbed. The area is highly patrolled by lifeguards, rangers and game wardens. Fish and game laws are strictly enforced.